I saw Pirates of the Carribean 3 today and liked it. That “musical” in the beginning? Fun for the entire family! What a way to start the feel-good motion picture of the year! Seriously, it was full of crazy, crabs, the shocking return of a key character, and Pym Particles. 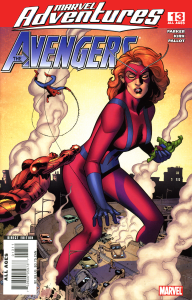 Speaking of Pym Particles, I finally made it to the comic shop and Marvel Adventures – Avengers #13 was a book that I picked up. This book just earned a rare spot on my pull list due to the last three issues being made of complete and decisive win. This issue features the Avengers facing a threat that infects one of their own (guess who?) and they have to go to another someone (again with the guess who) for help. Also in the buy pile was Green Lantern 20 (ha, check out the big brain on Hal!) and Countdown 48 and 49 (it’s getting better and more interesting). After all the nonsense that happened this week (trust me, you don’t want to hear me whine about it), my ability to draw fell back to what it was during the art lull. Then again, it may have been the lack of sleep doing it. I drew this pic of Metamorpho where the upper body was okay enough, but was a failure from the belt to the badly-drawn feet. Now, what’s weird is that I didn’t see how messed-up they were until after they were drawn, scanned and flat-colored. Actually, I redrew the head to look more Fradon-ish (since I love her art in the Metamorpho Showcase TPB that I’m reading now) and redrew the right leg. Then I redrew both legs. Four times. Each time, no dice. Efforts to redraw the pose completely also failed. I have NOTHING for the Illmosis update tomorrow. Yet.